One of the most popular blogs today is Blue Egg Brown Nest. I became very interested in this wonderful offering as I love home decorating and projects that I can do. 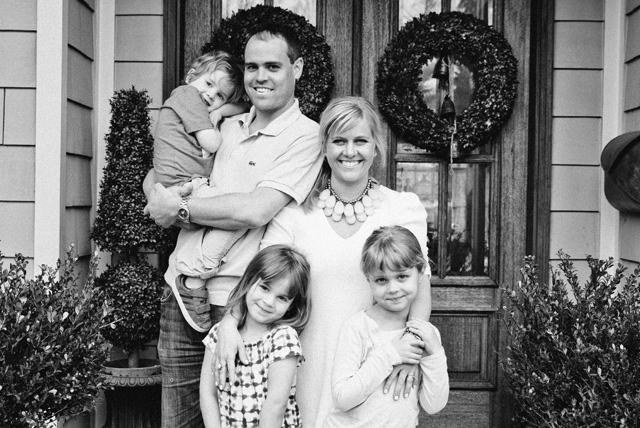 Christen Bensten is nationally acclaimed for her talents in giving new life to furniture. Our magazine staff caught up with her and had a wonderful time photographing her work. I wanted to share a wonderful interview with her. She inspires so many of us to try new things and create pieces that will have new life. You are known as the Annie Sloan chalk paint expert. 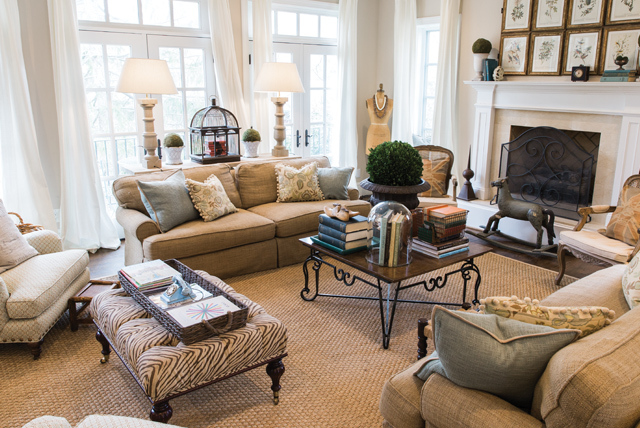 What was the first project you did that lead you to this career in giving furniture a new life? My kitchen chairs. My husband and I were in the process of building our home, and I had no budget for furniture. I had purchased a little painted demilune table a few years prior and wanted to see if I could achieve the same look. I found eight wheat-back chairs on Craigslist that were stained a terrible, ugly brown. I made my husband go to pick them up, and he thought I was crazy for buying them. I did a bit of research online and ended up with five bags of milk paint, three cans of stain, liquid adhesive, and stripping chemicals. I had no idea what I was doing. I also had a newborn in a little bouncy chair next to me and two little girls playing about me. I was determined. It took me two weeks to come up with the perfect color combination. Once I had it I finished all eight chairs, and they were beautifully rustic. Once I realized that I could do it, I wanted to refinish more! What led you to start a blog? I started to collect a few vintage pieces of furniture in my garage. I had planned on refinishing them and thought it may be fun to start a blog to document the process. It turned into the best career I’ve ever had! How many pieces of furniture do you refinish in an average month? It varies on the time of year. Spring and fall are my busy times. I think clients are ready for change and to refresh during these seasons. On average 8 to 10 pieces a month. What is the most challenging thing in balancing career and being a mother? I don’t always have the energy that I need to do everything I want to do. I always have the next idea, but sometimes I have to be patient with myself because I don’t have it in me to start the next project. I joke that I am training my kids as I go, but it really is the truth. I want them to see their mother doing something that she loves to do, that is creative, and that it can be a career. I believe parenting by example is the best way to teach your kids. My kids have spent their childhood with Blue Egg Brown Nest. They know it by name. They introduce themselves to my clients and beg me to paint. They attend the fairs that I’m in, and they watch me write every single morning. I’m proud of that. I am saying to them, you can have a family and also do something really wonderful for yourself too. 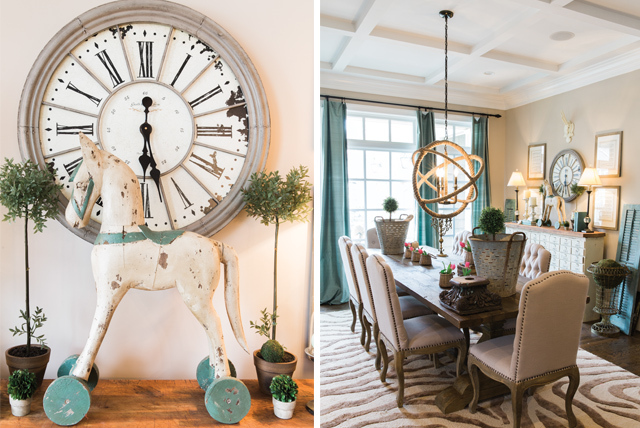 What excites you the most in today’s décor? 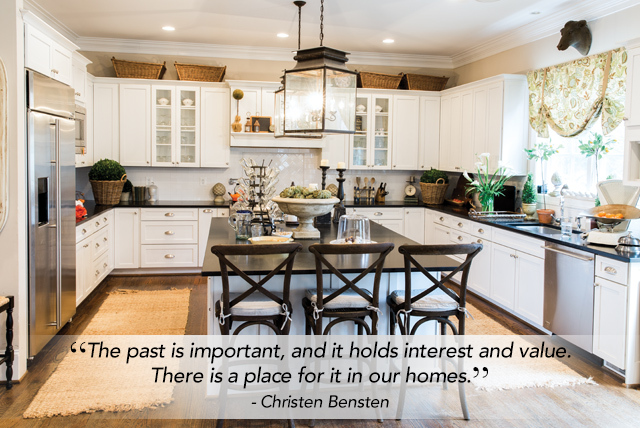 I am so excited when I see homeowners introduce a beautiful and important piece from the past into their homes. It could be a series of tattered Nancy Drew books or an old alarm clock. 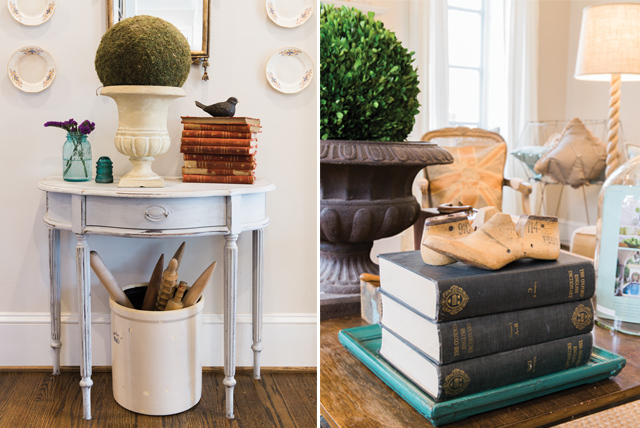 I know that we love these timeless pieces, but we have not always known how to leave them out on a coffee table and love them. I am happy to see that we are learning how and getting away from buying every home accent at the large retail shops. The past is important, and it holds interest and value. There is a place for it in our homes. Do you know the age of your audience? Based on the e-mails that I receive I would think it is from 30-70! Yes, a wide range. I received e-mails from young mothers that don’t have the extra money to spend on new furniture, want to achieve a certain look, and are willing to get creative. I also hear from older women that are retired and want to do something creative with their time. I really feel like we are a beautiful community of painters and decorators just trying to create beautiful spaces to live our lives in. What challenges you the most? Probably continuing to put myself out there. I am truly an introvert. I could spend a full week locked away in my house putting around and never getting bored. I love writing and connecting to people through my writing. However, there is a vulnerability to it when doing this over the Internet. I expose myself, my feelings, my craft, and my family. There is a great reward, but I’m also very aware of the risk. The majority of people and my readers embrace me and can relate. There are always a few bad apples in the bunch, though, and I’ve never been very good at ignoring them! I get a bit feisty and protective over Blue Egg Brown Nest and sometimes I can’t help but roar. What I do find, though, is that my beloved readers are always there defending me and my work. It is amazing. I want to have each and everyone of them over for tea and look them in the eyes and hear all about what they have going on in their lives too. We will do that in Heaven, I say. Were you an artist before you began your career? I have always had a great appreciation for art. We grew up going to the art museums. I also watched my dad work in his own studio. He is a jewelry designer as was his dad before him. Before having kids, I had my own pottery studio where I worked from my home on my wheel, mixed my own glazes, and fired my own pieces. I sold my pieces online and at local fairs. It was a good precursor for what I’m doing now with Blue Egg Brown Nest. What’s your favorite project that you have ever done? Probably the armoire in my bedroom. I was so excited to find the perfect vintage piece. I think I finished it over a weekend because I was so excited to place it in my room. Where do you find your inspiration for finishes? I grew up reading Emily Bronte and Jane Austen and had this idea in my head that when I was an adult I would live in a cottage built of stone in England. I haven’t quite made it there yet, but I do try to create that type of feeling in my own space. I am inspired by old books, green topiaries, and colors found in nature. 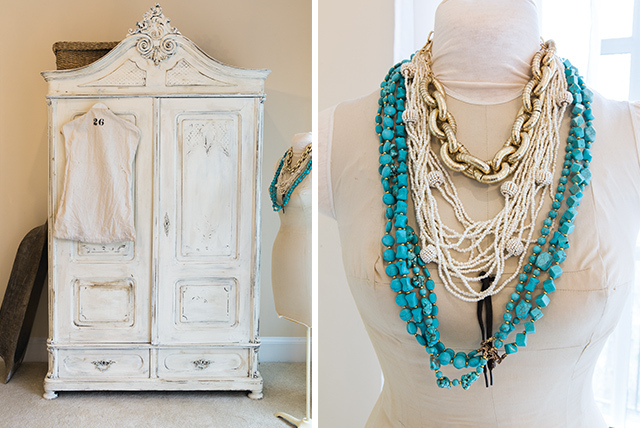 I tell clients all the time to pick neutral colors for their pieces. I really do believe that if you pick something in the white or grey or blue family then you will find that you can place that piece in any room in your house. Easy. My lifelong dream is to see my very own book on my bookshelf. I have always wanted to write and finish a book. I do believe that God has given me Blue Egg Brown Nest as this perfect little gift and that he has also given me this desire. It is the time. I am working on it now, and I do believe I will see this dream come true. Is there anything you want to share with our friends on the blog? I would encourage readers who want to pursue something creative to not look to your left or to your right. I want you to look inside. I want you to look to your past. I want you to look to your history and your person. What is it that gets you motivated? What excites you? What are you good at? What bridge have you had to cross to get you to where you are? What pain have you overcome in your childhood? Think on these things, and find your creativity from where and who you are. We are all snowflakes. Each one of us offers something different than the other. Not one of us is better or worse, we all have different edges and lines. If we could all harness this belief and know that what makes us different is what also defines us and makes us special, I think we would be walking through life sharing our experiences with creative and whole people. 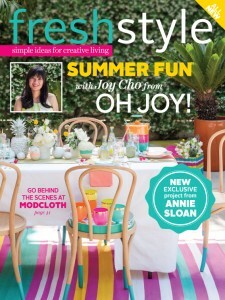 Check out the rest of the interview with Christen Bensten in the July/August issue of fresh style! Subscribe to fresh style today! I guess no answer id THE answer. Thank you for this introduction! I don’t know how I have missed her, or you, for that matter!! Hooray for featuring Christen here. I am *so* fortunate to have several of her pieces in my home….she was a joy to meet, she was extremely generous with her time and her ideas, and she is a person I have come to admire greatly for her open mind and open heart. Christen is a great inspiration, when you are passionate about something keep going for you dreams and they will come true. Congrats on the magazine article……waiting for you book! I truly love this post because it resonates with me. Thank you for sharing your interview with Christen with us all! As usually your posts inspire me in my daily work. Happy thoughts lead to a happy day. Love your posts! I can certainly understand why you enjoy her blog and her work. Creative and delightful. Loved reading this interview , so encouraging and inspiring , makes me want to tackle a few projects. Best wishes on a book definitely one I would read. What an inspiring post. I too like to repurpose things from my past. They bring back wonderful memories of those gone from earth, but looking down from Heaven. I try to imagine if & how they were inspired by these old treasures that have been made “new” again! Ha! I, too, have dreamed of living in a stone cottage in England. I do love the look of this furniture and I love how you’ve put together just a lovely happy home. Create on, dear girl!